After a year of seemingly fruitless talks, the December 31 deadline for the renegotiation of the current Special Measures Agreement (SMA) between the United States and South Korea has unsurprisingly lapsed. Although it’s not the first time this has happened, the situation now is in many ways fundamentally different. The SMA outlines South Korea’s contributions to the non-personnel costs of hosting the U.S. military and has been updated every five years since 1991 to ensure Seoul shares about half of the burden. In 2018, South Korea paid around 960 billion won ($860 million) for the 28,500 American troops stationed there, which U.S. Forces Korea (USFK) claimed only amounted to about 41 percent of the non-personnel costs. However, rather than asking Seoul to again meet them halfway in a renewed deal, the White House is reportedly asking for a 150 to 200 percent increase. For reference, when the SMA was last renegotiated in 2013, Seoul’s initial contribution jumped up by only 6 percent. Washington is also reportedly looking to renegotiate the agreement every year. The drastic shift in the U.S. negotiating stance is by all accounts driven by President Donald Trump himself. Throughout the presidential campaign he consistently criticized South Korea’s financial contributions to the alliance, once claiming it was “peanuts compared to what the U.S. spends.” This same attitude has carried over into his presidency, where Trump has criticized costs seemingly every time U.S. troops in South Korea are mentioned. The most consequential incident was when this belief contributed to Trump’s unilateral decision to end joint U.S.-Korea military exercises at the conclusion of the Singapore summit with North Korean Kim Jong Un last June. Then-Defense Secretary Jim Mattis was left in the dark on this decision and his recent resignation was arguably at least partially in protest of how Trump treats allies like South Korea. South Korean opposition to the new terms the Trump administration is trying to push through has been made quite clear in the public discourse there, where the negotiations are also receiving far more attention than in the United States. Throughout the year, various media outlets have highlighted numerous studies and commentaries showing that the figures the United States is using for how much South Korea pays into the relationship are only a fraction of what the country actually contributes. One study by the state-run Korea Institute for Defense Analyses found that once indirect support is accounted for – such as free rent for military bases, no taxes, and paying base relocation expenses – annual contributions have been as high as 5.4 trillion won in recent years. This is well over the total upkeep for American troops, but the Trump administration doesn’t seem willing to acknowledge indirect benefits provided by South Korea and Seoul is reluctant to let them be ignored. While the previous renegotiations in 2013 also ran past the end of year deadline, the prospects of both sides once again reaching an agreement in January appear slim. Not only are both countries still quite far apart on what the final deal should look like, but there are a number of other possible complicating factors. Even though the American military service members in South Korea aren’t at risk of being furloughed in the ongoing government shutdown, the State Department, which is in charge of negotiating the SMA, is. It is unclear if the shutdown will hinder the ability of U.S. negotiators to engage in talks, but the risk that it does increases as the shutdown endures, and it doesn’t seem as if there is an end in sight. Further, if Trump compromises on funding for the border wall, he could entrench his position with Seoul in an effort to not give in on back-to-back negotiations. Though talks may drag on, they are unlikely to directly and immediately impede the ability of the alliance to respond to threats. According to an official in South Korea’s Ministry of Foreign Affairs, the provisions of the expired SMA require Seoul to cover costs until the new agreement is reached, which will come from a pool of reserve funds. This – along with 8,700 Koreans employed by USFK being notified they would be laid off in mid-April if a deal isn’t reached – certainly adds more pressure for South Korea to budge, but shouldn’t necessarily affect military readiness in the interim. However, the most significant cost of the stalled negotiations is the erosion of trust in the United States as a reliable security partner. 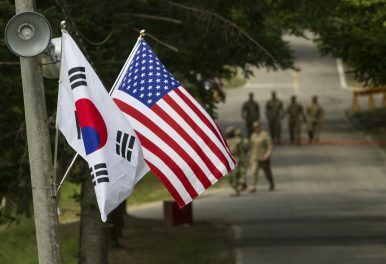 While there is room for Seoul to pay more into the relationship, the approach taken by the Trump administration – namely, leveraging troop withdrawal for short-term economic gains in SMA talks – risks long-term U.S. strategic interests by potentially driving South Korea to look elsewhere for its security needs, opening a potential gap to exploit for competitors. In the context of the ongoing diplomacy with North Korea, that the United States and South Korea remain starkly divided in the cost-sharing renegotiations is particularly alarming. Despite Pyongyang’s continued rejection of working-level talks, Trump is still planning on holding a second summit with Kim Jong Un soon. Trump’s 2018 move to suspend joint military exercises to save money after the first summit – where he also reiterated his desire to ultimately bring American troops in South Korea home over their cost – was well ahead of the SMA deadline. Now that the deal has expired and Seoul does not look willing to meet his high demands, Trump could conceivably singlehandedly announce a troop drawdown at the second summit as a goodwill gesture to Pyongyang and claim that he gave Seoul a chance to address his budgetary concerns. The U.S. Congress has attempted to limit the scope for the president to take such action by tying funding for withdrawing troops below a 22,000 threshold to the endorsement of the secretary of defense that “such a reduction is in the national security interest of the United States and will not significantly undermine the security of United States allies in the region.” Regardless of who the next secretary of defense is and how they judge the issue, it would still be a major blow to the alliance if this ever came to pass. Any strain on the relationship caused by the SMA discussions so far can certainly be mended, but a solution to cost-sharing that is at the very least tolerable to both sides is still needed. If Trump goes unchecked and holds to his convictions, unresolved burden-sharing negotiations could lead to a much bigger hurdle in the relationship.